The music of Parameshwar Hegde is marked by an adherence to the principles of purity and restraint. It is distinguished by an intense quest for beauty through the medium of melody. 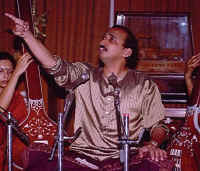 Critics discern in Parameshwar Hegde's singing the most beautiful elements of Rajguru's music, which is the confluence of three gharanas- Kirana, Gwalior and Patiala. In addition, Parameshwar Hegde brings to his art his own fine imagination, which takes flight in passages of subtle and daring improvisation. Gifted with an evocative voice with commendable octave range, Hegdeji brings to his vocalism an agile imagination, a passion for the purity of the swara coupled with clear intonation and a remarkable grasp with layakari. His taans are forceful and his rhythm play has a charm of its own. A dynamic fusion of swara and 'laya' which is the hallmark of the Gwalior Gharana informs the music of Hegdeji. Listening to his music is most definitely an exhilarating and a powerful musical experience. Hegdeji is also adept in rendering 'bhajans' 'padas' and 'vachanas' soulfully. Parameshwar Hegde is undoubtedly a genuine custodian of the art of Pt.Basavaraj Rajguru one of the greatest musicians of our era.